I have to confess that I don’t actually play very much Commander, but I do buy Commander supplements fairly regularly – and cards like Boreas Charger are a big part of the reason why. You just don’t see designs like this very often in other sets, and one reason is because it’s actually pretty powerful. Even just guaranteeing a couple of future land plays is often worth a deck slot, but it triggers on any form of it leaving play – Whitemane Lion decks can’t get enough card advantage, and that’s even before you start using things like Reveillark. A turbo-Knight of the White Orchid, Boreas Charger needs to leave play to get value, but the potential value is definitely solid. There obviously are decks where its acceleration is better; you’re usually going to go from three mana to five on the following turn, presuming nothing weird happens, and being able to get any land with the Plains subtype is powerful enough. Especially for Legacy, with duals on hand to be fetched. 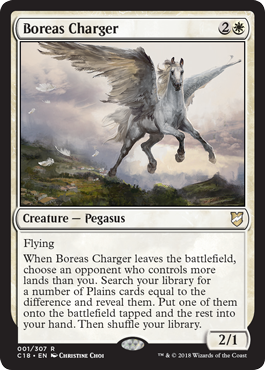 I don’t know how good Boreas Charger will be, but it is strong enough go work in Commander and other multiplayer settings, and it might have enough reach to do some work in Legacy; even if the land tutoring is less relevant early, being a 2/1 with flying that has a value-packed death trigger can take you places.